Please note: This online guide is still a work in progress and some articles may be undergoing significant changes. 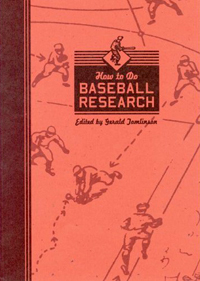 The How to Do Baseball Research Guide improves and expands the advice from two books previously published by SABR, the Baseball Research Handbook of 1987 and its update, How to Do Baseball Research in 2000. This iteration, first made available online in 2012, contains significant updates to the concepts presented in the earlier books, as well as some topics that were not covered previously. The online format makes further updates, expansions and improvements simple. This version will be continually updated as information and research techniques change. When changes are made, they will be noted on the Updates page. Research techniques: General research techniques that cover all aspects of baseball research. Resources: Lists of baseball-oriented resources you can use to get the information you need. Topics: In-depth articles on how to research in particular fields. Since the Guide will be updated over time by many people, it omits bylines; while most of the articles were written by a single research expert, all of the authors represented here are credited in one place, the Acknowledgements page. If you would like to suggest an improvement to the Guide, please see the Contributing page or contact Jacob Pomrenke. For a comprehensive list of research resources available online, visit our Research Resources page.